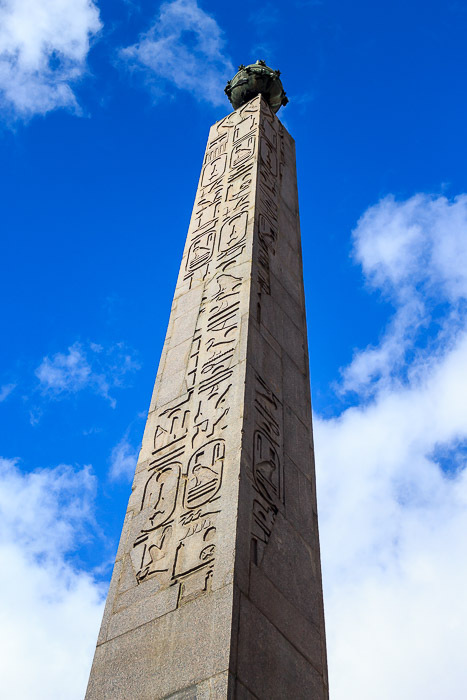 The Solar Obelisk has a height of 71.5 feet (111.4 feet with base), weighs 230 tons, is made of red granite, and is covered with hieroglyphics. Psammetikos II (595-589 BC), the third king of the 26th Dynasty, erected this obelisk at Heliopolis near Cairo during the 7th century BC. Many of the inscriptions have eroded away, though a list of the king's many names remains: "The Golden Horus, 'beautifying the Two Lands,' beloved of Atum, lord of Heliopolis; the King of Upper and Lower Egypt, Neferibre, beloved of Re-Harakhti; the son of his own body, who seizes the White Crown and who unites the Double Crown, Psammetikos, beloved of the Souls of Heliopolis." 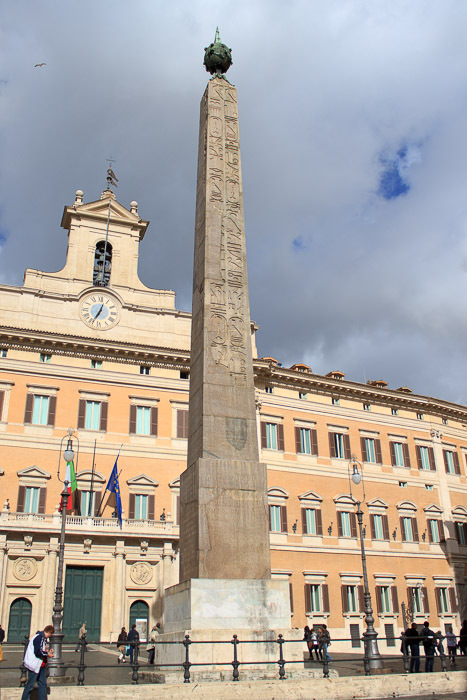 Like the Flaminian Obelisk at the Piazza del Popolo, this obelisk was brought from Egypt to Rome by Augustus in 10 BC to commemorate his conquest of Egypt. When he brought it to Rome it caused such a stir that even the ship used to transport it was kept on public display. It was re-erected in Rome in 10 BC in the Campus Martius, where now Piazza dell'Impresa is found, to form the gnomon (needle) of a sundial designed by the mathematician Facundus Novius in a vast square (Horologium Divi Augusti) between the Ara Pacis Augustae and the columna Antonini Pii, where its shadow on an extensive pavement of marble with inlaid strips of gilt metal on the north side of the shaft indicated the hours of the day and the days of the year. It was extremely important to have an accurate calendar because an ever-increasing number of days belonged to the gods and had to be celebrated. By 12 BC, when Augustus took over as pontifex maximus, the calendar had gotten ahead of itself because the priests had been observing a leap year every three years instead of every four years. Because of the new meridian, Augustus could announce, in 9 BC, that the error had been corrected and everything was now back in order. Seventy years later the indications of the dial were incorrect, and it was supposed that the obelisk had been slightly displaced by an earthquake. It remained there, in the Campus Martius, for many centuries and was still standing in the 8th century AD, but it was subsequently knocked down and broken into five pieces at some unknown date. It was discovered buried in 1512, but was reburied. In about 1484, and at various times in the next century, portions of the pavement were found, with the gilt lines, and figures in mosaic around the edge representing the winds and different heavenly bodies, but they were covered up again and are not visible. The height of the obelisk would require a pavement extending about 110 meters east and west, and 60 north and south, to form the described sundial. The obelisk was excavated and found split in five pieces in 1748, but in spite of various attempts, it was not set up again until 1789, by Pope Pius VI, in the Piazza di Montecitorio, its present site. The reliefs are partially lost. Pope Pius VI put a symbol of his coat of arms on top of the obelisk thus restoring the sundial; at noon a sunbeam goes through an opening in the globe and it ends on a series of marks on the ground showing the various dates when the sunbeam should strike those spots. See all Solar Obelisk photos.